Opening 13 August, Saturday, 6.30 pm. Artist Talk 16 August, Tuesday, 6 pm. Exhibition runs till 9 September 2011. 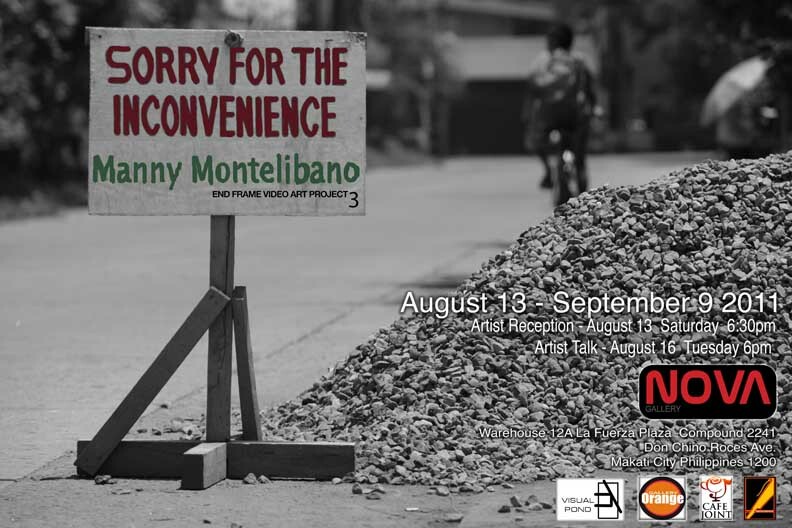 Visual Pond’s End Frame Video Art Project 3: Present, together with Gallery NOVA, presents Manny Montelibano’s Sorry for the Inconvenience, the latest exhibition of the 2011-2012 Philippine video art festival. The solo exhibition of Montelibano opens at Gallery NOVA on 13 August 2011, Saturday, at 6:30 pm with an artist talk on 16 August, Tuesday, at 6 pm. The show forms the fourth solo exhibition of the Bacolod-based Montelibano, who has been practicing as an artist and showing at various venues in Manila and the Visayas since 2002. Montelibano received his training through his experience as technical director at University of St. La Salle in Bacolod and through a 2004 director’s apprenticeship under filmmaker Peque Gallaga. Crossing fields, Montelibano is a member of the Black Artists in Asia Association Inc. and founded Bacollywood: The Visayan Film Festival. He also cofounded the production collective Produksyon Tramontina Inc. An active member of his community, he often shows in group exhibitions in his region. His other solo shows include Greater than or Equal to Infinity (Gallery NOVA, 2010), Escabeche: Filipino Sweet and Sour (Galleria Duemila, 2009) and PO Asa (Gallery Orange, 2008). Montelibano’s Sorry for the Inconvenience is the second offering of End Frame Video Art Project 3, following Tad Ermitaño’s exhibition last January. Curated by Clarissa Chikiamco, the theme of the third edition, Present, refers to the current project’s focus on selected Philippine contemporary artists’ practices in video art. Throughout the festival, each artist stages a show presenting new video work in various venues from 2011 to 2012. Other artists presenting for End Frame 3 include Claro Ramirez, Kiri Dalena, Yason Banal, Kaloy Olavides and Maria Taniguchi.